Yesterday, at St. Pierre du Bois Parish Church, my eldest little sister got married and I was fortunate enough to be the one to give her away. The ceremony was perfect and the newly appointed best man got everything spot on despite the one days notice. My little brothers even managed to perform their usher roles without supervision. After the obligatory photos and confetti storm we headed to the beautiful island of Herm, just a 15 minute trip by boat, for drinks followed by conversation and a rather unusual but tasty mix of food in the specially erected marquee. We toasted the married couple and tried to put into words our own personal messages in their book while snapping the many photos that were filling film and memory card. My sister’s red trainers (put on for the reception, not the service ;-) were well hidden beneath her dress but will no doubt appear on some of the pictures. There was laughter and a few tears but the soft drizzle that Herm bestowed upon us could do little to dampen our own spirits. Clarissa was looking rather resplendent in a long black and pink dress that drew compliments from relatives, some new, some I’d not seen in a very long time. Hopefully now I recognize the faces I’ll spot them around and about in Guernsey, it’s quite common to bump into people you know at random on such a small island. My little niece Holly, their child, bopped away in the dance area for hours to both the live band and the DJ. I’m pretty sure she danced longer than anyone else that night pausing only for a brief nap… well she is only 18 months old. If you are considering a trip to Herm get to the boat 30 minutes before the scheduled departure time. Like time, and indeed tides, Travel Trident wait for no man and left early on both sailings and we were the luckier ones to get back, many of my family had booked hotel rooms for an overnight stay. As we sailed back I wondered where my house keys were… It dawned on me that I’d left my USB keyring memory stick plugged into the front of my work PC earlier that morning as I desperately tried to print off another 15 Orders of Service because my Epson printer had failed me (more on the idiots at Epson another time). Alas my work keys were at my parents house… and my parents were in Herm. My thanks to Michelle and Amy for driving a rather intoxicated me across the island, my colleague and friend Adrian for loaning me a key to the office and to Clarissa for keeping her cheer long after the cold of the night had drawn in. Travel Trident left early because the boat was full and another one was waiting in the wings. Well planned and thanks guys! Driving in France was less terrifying in my own car than in the left-hand drive rental cars I’ve used in the past. The run from St. Malo through Rennes, Le Mans and up to Paris was uneventful punctuated only by the unidentified random songs and the splatter of unfortunate insects emptying their stomachs onto my windscreen at 140kmh. I went through Paris, around the five lane ring-road several times and even drove along a section of road where I could see the fabled Arc de Triomphe, noted across Europe for being a top spot to avoid while driving because of it’s twelve avenue junction that surrounds it. My trusty Nissan Silvia S14 (200SX) performed perfectly in the 1,426 miles I clocked in one week – impressive for somebody who lives on an island just nine miles long. The black-on-silver registration plate with it’s five numbers and no letters attracted some attention including a confused pedestrian who nearly made it the last thing he saw, and a driver at a petrol station who asked me where I was from before accidentally paying for my fuel. No doubt the confusion also saved me from the occasional horn beep when hesitating at a junction for a second or not meeting the French minimum speed of “sign-posted maximum speed + 35%”. Little had changed since my previous visit, same rides, same long queues and the same blistering heat punctuated with a shower. The Maz was closed as was the center of the square and the Mexican themed restaurant. The paddlers were not in operation and looked quite decayed from the train Star Tours was either going for added realism of an olfactory nature or else somebody had recently emptied their bladder inside, either way the result was quite unpleasant. Space Mountain had been upgraded to a new 2.0 ride but alas we couldn’t ride this for our own reasons. One new feature is the FastPass which means you can get a ticket for a ride and come back between the times it mentions, joining the shorter FastPass queue. Alas, not all rides support FastPass yet and on Thunder Mountain the FastPass queue still took 25 minutes. You can also only have one FastPass active at any one time, and the longest queue was for Peter Pan again with FastPass machines switched off. Europeans not used to the heat and it still amazes me that Disney can’t fork out a few quid to cover the queuing areas. As it was we saw one woman pass out in the queue for Peter Pan. The parade was rather short and disappointed Clarissa who had fond memories from a trip many years ago when she stayed at the rather wonderful Bayport view. One pleasant surprise was the restaurant located right next to the Pirates of the Caribbean ride which had a wonderful atmosphere, the ride itself passing through it at one point. Through my own oversight we missed Pooh’s story time and the main indoor show. This whole park was new to Clarissa and myself and made up for my disappointments with the main park. Access was included in our three day hopper passes and everything in here was impressive from the back lot studio tour with it’s great physical effects to the Aerosmith themed indoor roller-coaster (which stopped part way through and we got to see it all with the lights on), the space-station simulation ride, a build-your-own-virtual-roller-coaster played back in a 360′ simulator, and a live stunt show. This stunt show deserves a special mention, it was quite possibly the most impressive thing I’ve ever seen in person. Five cars driving at high speed performing stunts, jumps, two-wheels, simulated crashes with people being shot and falling from the top of buildings to motorbikes doing stoppies, crashing and the riders catching fire. The most amazing thing was it all worked perfectly and that these guys perform all this twice a day… Wow! Queues were very short, about 5-10 minutes maximum and there were very few shops instead there were many things to look at such as the Disney history and the tour of Disney Europe’s actual TV studio which is hosted here. You could learn about how a Disney character comes to life (in this case Mushu from Mulan) or enrol in a drawing class and learn how to draw the mouse himself. Most impressive! Still to come… Versailles, the The Château of Valançay and Parc Asterix! The agenda for my trip is coming together although various changes had to be accommodated because of factors outside of my control, the biggest one being me now returning home right after Nuremberg followed closely by the change to take my car across for the French leg. The timetables from Saint Malo are sketchy at best and we still needed to get around between Saint Malo, Disneyland, Paris and Charles De Gaulle airport. So with haste I equipped my Nissan Silvia S14 (200SX) with the headlight converters, first-aid kit, warning triangle, jump leads and a spare bulb kit. A map, torch and compass may also be useful if I can find decent ones locally, failing that I’ll muddle through. It is being serviced tomorrow night and hopefully the Pioneer iPod adapter will spark to life too. I’m a little nervous about driving in France again, the last two trips I’ve hired a left-hand-drive car so I kept to the “you still need to be sitting in the middle of the road, just like back home” school of thought to keep me driving on the right. With my car being obviously right-hand-drive it might make for unfortunately interesting times. I’ve also been warned that the French police now hand out some pretty severe on-the-spot speeding fines but I doubt I’ll be going fast enough to garner any attention from them. When booking items individually start with the items that have the best refund policy or failing that, the cheapest. Don’t book late at night – systems update, become unavailable and prices suddenly recalculate. Tired eyes could also miss a painful typo. Some budget airlines won’t appear on LastMinute, Expedia or Travelocity. Head over to the airport official web sites for arrival/departure timetables to find out if any budget airlines service your route. If you don’t want to fork out for route finding or GPS gear then try the free route planners from ViaMichelin (indicates speed cameras) or RAC (more detailed inner-city directions). If staying in a country for more than a week and using a mobile phone consider acquiring a local prepay SIM card. As well as saving a small fortune in receiving/making calls and text messages you can text the temporary number to only the important people to keep holiday interruptions to a minimum. You will need to ensure your mobile is not locked to a specific network SIM – this is often the case with heavily discounted phones offered with a contract. While Lonely Planet and Rough Guides are jam packed with useful information you may find the fun and educational DK Eyewitness Travel Guides more useful for short trips. Visit cash machines on holiday with your Visa Debit card to obtain local money at a good rate without having to mess around with travelers checks and rip-off currency exchange shops. 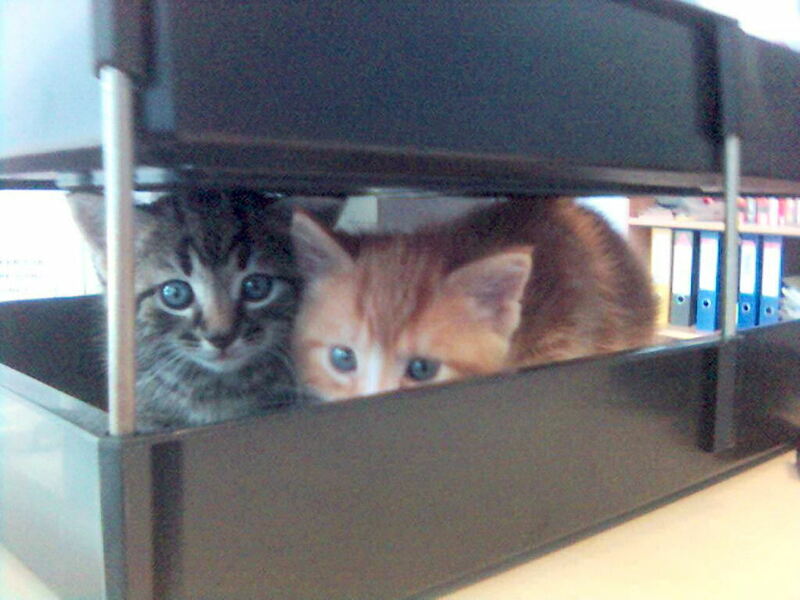 While I’m used to the odd cutesy kitten picture in my e-mail inbox having them turn up to play in your desks in-tray is much more fun. LemurGirl has passed me a music meme, so here I go! It goes all the way up to eleven! Uh, “1,966 songs, 6.7 days, 10.48 GB” according to iTunes. The last physical CD was The Hitchhiker’s Guide to the Galaxy: Quandary Phase audio book. On-line I purchased, The Chemical Brothers: Singles 93-03, via iTunes. There’s nothing playing this second, but iTunes tells me The Verve’s Bitter Sweet Symphony – Original has been getting too much playtime lately. One Second, Paradise Lost, English band doesn’t get coverage but this song pushes the moment more for me than Loose Yourself can. Can’t Lose You, Type O Negative, slow rhythm, deep vocals of Peter Steel and the strange sitar-sounding lead, The musical equivalent of getting drunk. _Princess of Dawn_, Mantronix & Tip, an old Amiga demo track from Crystal Symphonies that I recently managed to convert to MP3. Hypnotic.